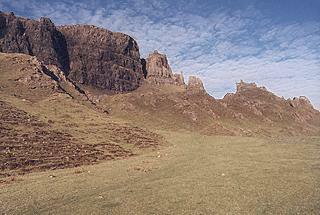 Many of the 'chase' scenes in "Destiny" take place near the Quiraing in the Trotternish area of northern Skye. This has scenery like nowhere else in Scotland and is the result of large scale land slippage which has left enormous columns of free standing rock. Plockton to Kyle of Lochalsh. Then A850 to Portree passing over the toll bridge to Skye. From Portree take the A855 (partially single track) to Staffin passing on the way the Old Man of Storr - a large column of Rock visible for many miles over this part of Skye. A few miles past Staffin there is a turning on the left into a single track road to the Quiraing and Uig. Drive along this for a mile or so and there is a large parking area on the right hand side of the road if you want to explore the bottom of the Quiraing where the scenes where shot. From the car park head up besides the small stream taking the right stream at the Y junction. After a hundred yards or so you will come out onto an area of short grass. This is the area where TV John and his brother appear on horseback in the episode. If you want to go up to the Quiraing itself just head towards the rock columns and you eventually come across a faint path heading up which joins with another path to go to them. Alternatively you can drive a mile or so further on, and go up some hairpin bends to the top of the pass. There is a large car park on the left from where a path leads across the middle of the hill to the main rock columns which are about a mile or so away. It is by this path near the car park that Hamish Macbeth and Isobel Sutherland are shown going up the mountain in the snowstorm with the Quiraing visible in the background in Destiny Part two. Of the two routes the first mentioned is preferable as it's shorter, easier, and has the advantage that you don't need to come down (and up again) from the high level 'upper car park' path if you want to get to the locations used.